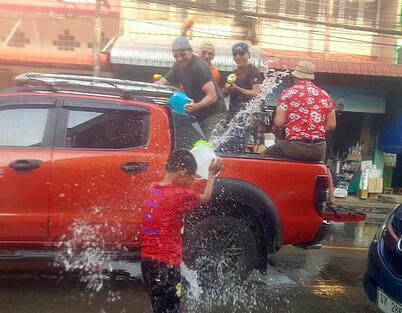 We spent Songkran, the Thai New Year in the city of Nan (northern Thailand) and had a BLAST via truck and foot through the streets of the city. This tradition stemming from the belief that cool water splashes keep our minds at peace, especially in this the hottest month of the year, everyone was armed with squirt guns or buckets of water in the big New Year's celebration. Those in our group (a bunch of non-Thai guys in their 40’s and 50’s) felt like kids once again, smiling and laughing while being welcomed by the Thai people for this occasion. We loved the fact that we appeared to be the only tourists in the town, and felt so loved by the warm spirits in the people from Nan. I had been warned about the water-splashing situation during Songkran in advance, and wondered if it would be a problem while riding. There have been instances where we’ve been literally crowded and brought to a complete stop in tiny villages, being covered with water either warm or ice cold, and laughing our heads off each time by the smiling faces greeting us. Video footage we’ll post at some point will show a parade we stumbled into with live music marching down the street, dancing, and offers of food, drink, and just to join these sweet people in relaxation and celebration. 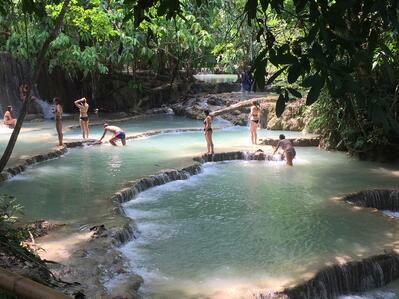 Photos and video will never do these moments justice though … this has been an experience that just can’t be recreated. Having crossed the infamous Mekong River a couple of days ago, we spent a couple of days in Luang Prabang in Laos being warmly welcomed by the people. 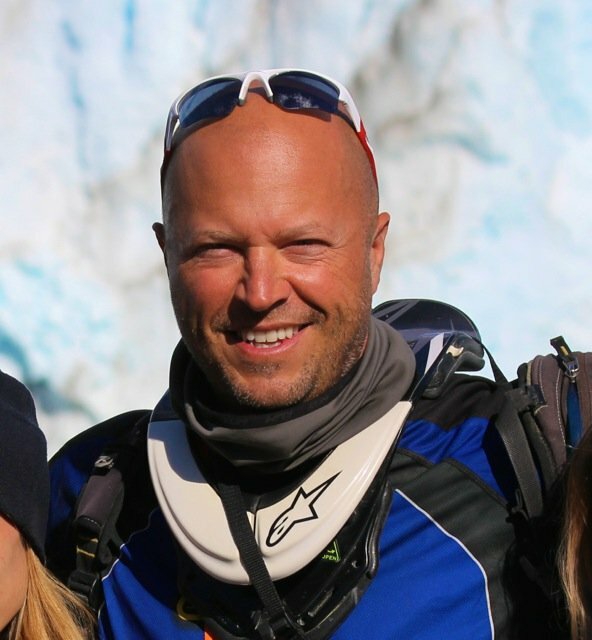 Soaking up the beauty of this country with every gearshift, just like with Thailand a few days earlier I had that reason to shout in my helmet once again …. 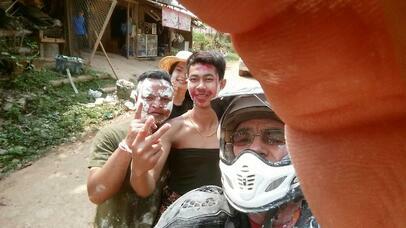 “I’m riding in Laos!” Such a fun rush for me, now on my 5th continent of adventure riding in the past 10 years. 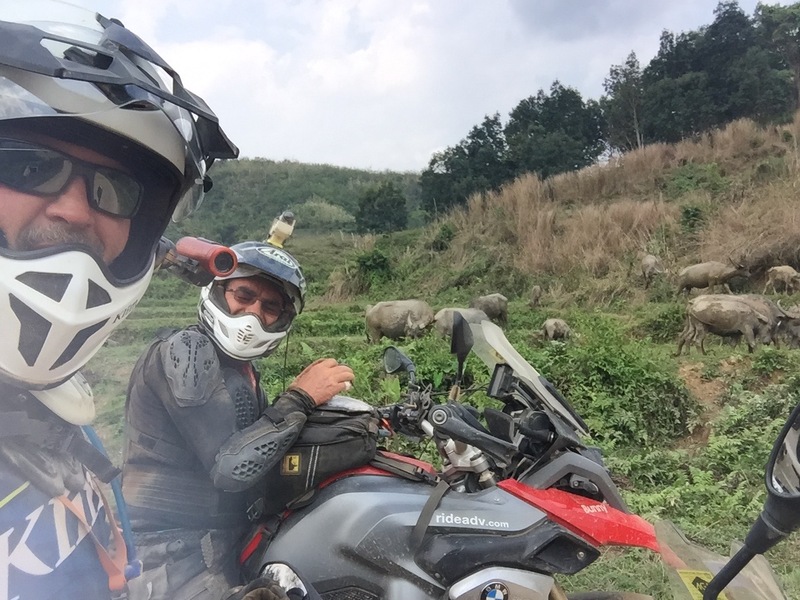 Dermot and I bent the ATGATT rules a bit yesterday and rode 30 minutes from the center of this UNESCO World Heritage site to the famous Kuang Si waterfall nearby. Families gathering from all over for picnics on local cuisine, and a cooling swim in these waters was only enhanced by getting to watch the Asiatic Black Bears (Moon Bears) romping around there on the grounds. Not sure if they are caffeinated or what, but wow are they an active bunch. 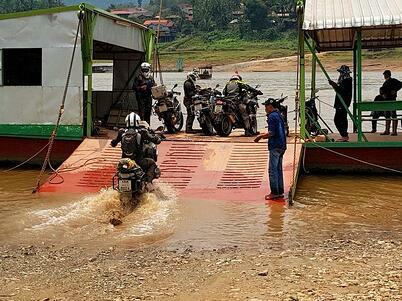 I can’t even begin to imagine how many tiny villages we’ve passed through, or how many beaming, genuine smiles of excitement have been passed our way as the kids and local folks hear the twin-cylinder reverberations emanating from these BMW GS’s. With thousands of scooters zigging and zagging amongst us each day, even in the remote and rural countryside, the big dual sport bikes still do stand out in the crowd. Two weeks into this trip, and I think we’ve only seen about 3 other big adventure bikes from outside our group thus far. More soon. 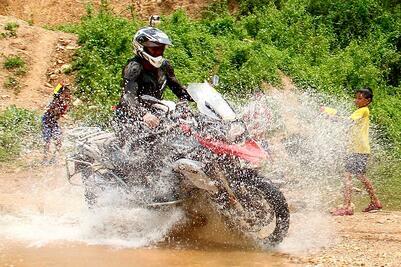 We still have a couple more days left to ride in Laos.